In 1970, at the age of seventeen, Don DeMola won the Carl Yastrzemski award, given to the best high school baseball player in Suffolk County, Long Island. The Yankees drafted him and shipped him to their Rookie League farm club in Johnson City, Tennessee, the first of three minor league stops in two years before the Yankees released him in April of 1972. This 1975 card doesn’t offer any reasons for this decision, which is illustrated by the use in the 1972 line in DeMola’s career major and minor league record by the always mysterious stat-less listing: Not In Organized Ball. It took exactly nine months beyond the reach of numbers, like some kind of second embryonic passage, before Don was signed in January 1973 by the Montreal Expos. 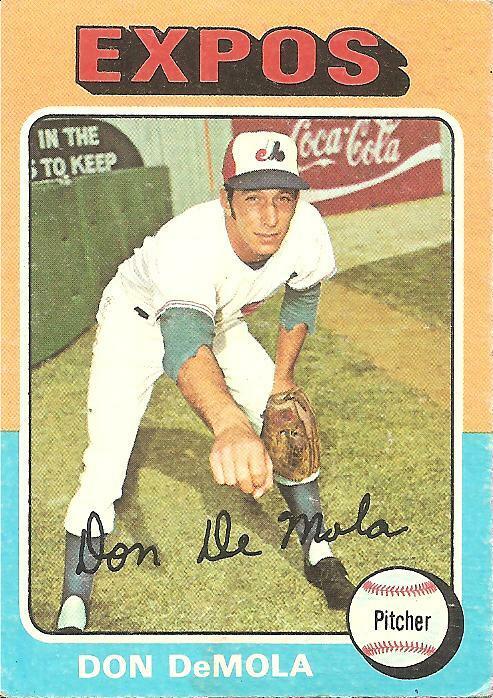 Back among the organized, Don sped up through the Expos system and within a couple years reached the big leagues and made it onto a baseball card, this 1975 offering, his first and second-to-last cardboard incarnation, which references Don’s rare skill: “Don’s best pitch is a fastball which ‘smokes.’” His minor and major league strikeout totals, which in most years hovered near the elite one-strikeout-per-inning mark, also attest to the wonders inside the seemingly normal arm he holds out toward the viewer on the front of the card. His small smile and the reaching arm ending in a loose fist make Don DeMola seem like a friendly, generous guy, someone who wants to share a handful of M&Ms with you. You are currently browsing the archives for the Don DeMola category.